Culiacan, Mazatlan and Los Mochis will serve as the three host cities. LAUSANNE, Switzerland -- Baseball World Cup officials recently concluded inspections alongside officials of the Mexican Baseball Federation, of the new venues in the Mexican State of Sinaloa and announced the location of the three six-nation groups, wihch will be based in Culiacan, Los Mochis and Mazatlan. It had been previously announced that only Culiacan and Mazatlan would be new host cities -- following news that the event would be moved from Baja California, but after the recent site inspection, it has been confirmed that Los Mochis, a city that is home to a professional baseball team in the Mexican Pacific Leauge, will also be a host city. Mazatlán will serve as the host site for the opening/closing ceremonies, championship final, and awards presentation. Ten of the top fifteen ranked countries, including Nos. 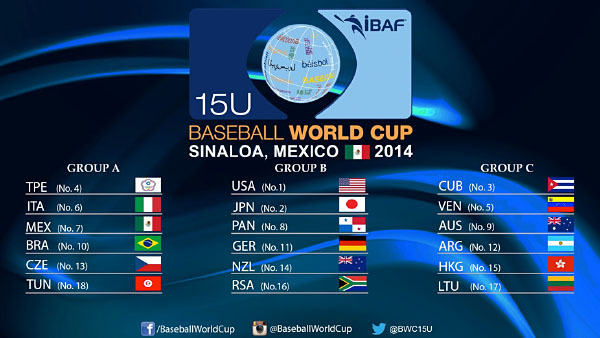 1-4, will be participating in the II 15U Baseball World Cup. Seven countries will be first-time participants in the 15U Baseball World Cup: Australia, Czech Republic, Japan, New Zealand, Panama, South Africa and the United States. The eighteen participating National Teams had already been seeded and assigned (based on current World Rankings and past performance at the inaugural U-15 Baseball World Cup in 2012) to their respective groups. Venezuela is the defending U-15 Baseball World Cup champion. Only in its second edition, the U-15 Baseball World Cup platform will potentially challenge what is arguably baseball’s toughest and best represented international competition, the U-18 (ages 16-18) Baseball World Cup – an event that has featured superstars like Canada’s Brett Lawrie, Japan’s Yu Darvish and Shohei Otani, South Korea’s Shin-soo Choo, Cuba’s Yasiel Puig and Aroldis Chapman, and USA’s Clayton Kershaw, Justin Upton and Buster Posey, among countless others – and which, in 2013, had a potential broadcast reach of 144 million homes and potential online/mobile reach of 20 million. The II Baseball World Cup will have unprecedented degree of global spread for a baseball event, one that spans Africa (North and South), the Americas (North-, Central- & South America and the Caribbean), Asia, Europe (Baltics, Central- and Southern Europe) and Oceania.